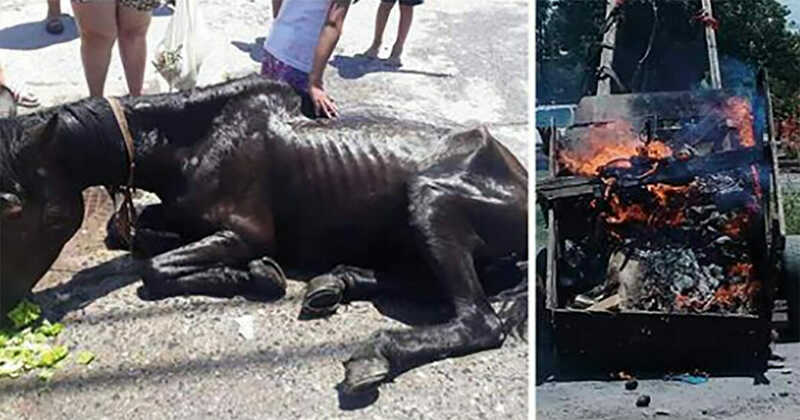 When Neighbors Realized that Malnourished Horse Wasn't Able to Pull Cart Stopped the Owner and Burned the Cart! Animal abuse is something I will never understand. For a person to abuse a helpless animal and make them suffer is a terrible act, but unfortunately it happens too often. This case of animal abuse occurred in Buenos Aires, Argentina, when a neighbor witnessed a malnourished and exhausted horse struggling to pull a cart. The horse was very skinny and overwhelmed by the heat. Suddenly, the horse fell to the ground unable to pull the cart any more. The poor horse was completely exhausted, due to extreme fatigue and malnutrition. Although the animal was on the ground unable to move, his owner had no sympathy and wanted him to get back up to pull the cart. The neighbor witnessed the man then hitting the horse to try and make him get back up. When the woman saw him attack the horse, she ran out of her house to stop him. Several neighbors joined her in getting the man away from the horse. On realizing that he was outnumbered the man fled the scene, leaving his horse and cart behind. The horse, which was named Romeo, had a number of bleeding wounds on his body, as well as an inflamed eyelid. The neighbors gave the horse buckets of water, which he drank until he was strong enough to stand. So that the man could never mistreat and punish Romeo again, the neighbors burned the man’s cart, according to La noticia 1. The animal was finally rescued by the Amora Protective Foundation, where staff said Romeo is enjoying his new found freedom.